Welcome to the latest Open Thread. I’m not going to list the fixtures – what’s the point – so you can comment on any of the games, any of the press comments, and anything else that comes up. I’ve seen a copy of the latest annual accounts from the ECB. They are pretty opaque, which is normal for most companies, but there is still some interesting stuff. Most importantly, turnover was £133m in 2015, which was an Ashes Summer, but this was £40m less than the previous summer when we had India.I think in one cool statistic you can see how much the financial impact of an Indian tour really is. It also begs the question that if you barely scrape a profit when the sun is shining on an Ashes tour, how much will turnover be for this year’s series and will it cover the cost of sales? Also, the leading pay for a director is £340k. I’m guessing that’s Tom Harrison. There are no mentions of pay-offs for Downton and Moores, nothing on Giles’s expenses and on the value of contracts for the players. As those of you who follow Chris and I on Twitter might know, we met for a drink with Lawrence Booth last night – he called me by real name, Peter, all night as calling me Dmitri would have been stupid. This means my anonymity, my pseudonym, is now compromised! Seriously, it was a nice evening, we had some good exchanges of views and I reckon that 5% of it might have been on “my obsession”. We all got something out of the evening, and although we had a chat on a basis of not sharing personal views on line – and I’ll stick to that – the one thing that rang clear is that this blog has a place and is widely read. And that includes the comments. So thank you to all for that. You made it get noticed. Still not decided about tomorrow and Surrey v Durham. Head hurts today! There now commences a ramble…..
It’s really quite difficult at the moment to think about what to write. Even the tedious Twitter bores, one of who called me “a KP groupie” yesterday are not exactly getting the fire in me going. In short, we are in calmer times, the world seems a much smoother place in terms of cricket, and thus blogging is a little bit sparser. I mean, what could I write that gets you to respond and energised when I don’t feel that way myself? But let’s have a quick chat about the last week. I think the most important story is that of the ECB’s chosen man, El Presidente for Life, Giles Clarke having that charming effect on his international colleagues. They ran away from him faster than Usain in an Olympic 100 metres final when his patron, the love Srini, was booted out of his roles in the BCCI reshuffle. That the individual governing bodies saw what we’ve known for years is not surprising (that it took that long is probably testament to how the Indian authority pervades the sport like a genial mafia don) but for some reason I don’t feel like cheering. Because one by one our source material is being eroded away. There’s no Paul Downton, who is the patron saint of BOC in my eyes. There’s no Peter Moores, a decent man but really not a shocker that he wouldn’t cut it again in the top job, yet those in the media who sang his praises still tell us we know nothing. But even they are disappearing one by one. There’s no Derek Pringle in the mainstream press, the Indy’s newspaper presence has gone and so has Bunkers, which leaves us just Newman and Selfey of the four horsemanures of the Cricket Pops. With Clarke going too, what are we to do, except to say, god, we were wrong about that lot weren’t we, us bilious inadequate, know-nothing KP groupies? The question for the ECB now needs to be what we do with Giles now his one aim for remaining, to become ICC President (or whatever), has gone. His presence is an utter embarrassment to us all. The backer of the big three takeover, he now stands alone from that unholy trinity and yet the ECB would rather ignore this. They don’t have the balls to stand up to him, instead focusing more on making sure the right messages are coming out over social media, as County Championship Live on Twitter seems to be falling over itself to buff up our beloved skipper. But Clarke remains a polarising figure. Loathed by the majority in the cricket-loving fanbase, be it pro- or anti- the other focus of opinion, Clarke seems to have the skin of a rhino. I can get angry at him staying, but that’s almost like being angry at a pantomime villain now. We await what the ICC does in the near future, but everyone who speaks about it seems to say this is a bright new era of world governance. Only there’s not a lot coming out except Giles being rejected. In a world where England cricket needs to build bridges and maybe show a little humility, there is no place for Giles Clarke. Let’s see how our board cope with that. I didn’t feel like commenting on the issue of Cook’s headgear. This seemed like a peculiar story, raised because our captain wasn’t playing with a helmet meeting our domestic standards, and then morphing into a story that showed Cook to be either a stubborn man or one who thought he could defy his own board and being bigger than their rules. I think it is the former rather than the latter, a man for who having the right things in the right place, and being used to certain set-ups is crucial, but there are good reasons to believe it COULD be the second one. This blogger is not about to set up the Alastair Cook Fan Club, that is for sure, but this story got right out of hand. It truly jumped the shark when Ian Botham, in a pathetic outburst, said it was “political correctness gone mad”. He’s entitled to his views, boring as I find them on cricket, but that’s just utter shite. If you are going to get your retired colonel schtick correct, it should be “health and safety gone mad”. Boycott saying the game has gone “cissy” is also just as stupid. Sometimes I weep. I really do. The piece Chris put together on the IPL really did hit the spot. I’ve tried to be interested but it doesn’t work for me. In the whole scheme of things that doesn’t matter, because it is the Indian audience that needs to be excited, not me. They seem to still care about it, the players genuinely appear to like playing in it, and that’s probably going to trump everything. That most games seem to be won by the team chasing also appears to be a concern, because when sport becomes predictable it loses excitement. Then when excitement goes, people might be less inclined to watch. The odd Kohli hundred isn’t going to make up for that. We’ll probably be saying this about the IPL in 10 years time, so to spend too much time on it is probably counter-productive. Of course, I am, or was, following KP’s progress in the IPL. It’s one of the rare chances we get to see him in this country, and yet again he has had injury problems to curtail his participation. To those who think that this is obsession, if I am guilty of wanting to watch the finest player I have seen for England in the past ten or so years, then I’m guilty of obsession. But not as guilty as someone who goes out of their way to criticise anyone who dare praise him, and fill their timeline up with their obsession! I was pleasantly surprised we didn’t see too much gloating, but THEREALTRUTH on the Mail covers it nicely..
No problem for the “EGO” no doubt the DM will soon carry an article written for the “EGO” TO THE EFFECT THAT HE THINKS HE BATS BETTER ON ONE LEG than the whole of the current England top order put together. Delusion cannot be cured ! Delusion. There’s great mirrors in your house….look in one for evidence of delusion. I am still waiting for the publication of the 2016 Accounts for the ECB. Last year the Company Secretary (Brian Havill, who left on 18 November 2015) and Auditor statements were signed on 9 April 2015. Last year they were formally filed on 24 April. It’s now the 25th of the corresponding month and there is no sign on the ECB’s website and the other data repositories I can go to, but they must be imminent. Why am I interested? Because I’m a nerd, and I can’t wait to see how they compensate certain individuals for “loss of office” (£192k last year, and this appeared to be, though I can’t confirm it, David Collier). The interesting thing is that Havill doesn’t appear to have been replaced (there’s no formal notification on data sources) as Company Secretary. Does make you wonder what happened there! Once I get a copy, I’ll have a sweep through and see what I can see. Lovely to see Kumar make a big one for Surrey yesterday. It’s a wonder he could communicate so well with his partners in major partnerships when he can “barely speak English” but do remember, the bile and vitriol is all our side. Interesting to see Daniel Bell-Drummond make a ton for Kent on what looks like a wicket doing something for the bowlers. I find those who make centuries when all about them are falling are a lot more valuable than the flat trackbullying. Bell-Drummond is local to me (indeed, I do believe I might have played against him when he was a kid) and been mentioned a few times as one for the future. I have a little local bias here, even though he plays for the wrong mob. Also going to be following Dan Lawrence, who looks to have a great future ahead of him, as he’s 44 not out overnight, and at 18 definitely one to watch. I’d like to thank the commenter (Fred?) who linked the Geoff Knox piece on the Day Night test. There’s a whole epic post in me on sport and money but this seems like a good place to start. Players apparently bought off to say everything in the garden is rosy and do the board’s bidding? Poor sight for spectators? People drifting away early? We weren’t told this at the time. Infantilising your “customers” is so symptomatic of the world we live in. Media management is more important than letting opinions out. It’s because we are too soft to take the truth, and dish it out. The reason people question motives, and think we all have an agenda, is because of these insidious techniques. You only have to look at how Maxie was questioned because he’d worked with Piers Morgan. I’ve been called a Piers Morgan front despite hating the man. We live in a world where managing the message is more important than the message itself. I’m just a blogger, writing what comes into his mind. I have no ulterior motive, I speak what I believe, open to hear counter-arguments (not abuse) and perfectly happy to admit I’m wrong when proven to be so. I’m not managing media or messages, other than moderating some small things. I’ve always felt my heart is in the right place. Mark Wood’s career is on hold as what appears to be a farcical approach to his injury has meant that the poor bloke has been rehabbing for months to get over a temporary fix in his injury, only for the injury to get worse and another, more permanent fix put in place. That’s how I understand it. Sadly this has been the way with England for too long. While they sort of got away with it for Stuart Broad and James Anderson, they didn’t with others. I often recall Andy Flintoff’s injuries being prescribed “rest” as a cure, only for him to rest, rehab and then break down again, meaning operations. KP almost had his career ended by an Achilles injury. Matt Prior played on with one, and had his career ended. We play too much international cricket, and players will also chase the big pay cheques. There’s no end to this in sight, so protecting them is key. Best wishes to Wood in his recovery. This should help move things on for a bit, and hopefully there will be some stuff up later in the week. Or earlier. This from the same person (not, I’ve been advised, a bloke – my bad for assuming that) who compared KP appearing as a pundit on England cricket to Jimmy Savile appearing at a kid’s party. I do get ‘em. Humility, intelligence, rationality and perspective. Fancy calling me a “serious commentator”? These people really must think I have the ego the size of an aircraft hangar. While not quite as fierce as the first open thread, the second certainly had its moments, although not many of them were related to the actual cricket going on – though some posted in their match reports or views and they are most welcome. So far a lot of the attention has been on the high scores for April and the proliferation of double hundreds. Ben Duckett’s 282 not out against Sussex on the opening week was joined by three first division double centuries – Jonny Bairstow making 246 against Hampshire, Sam Robson making 231 (and 106) against Warwickshire and Jonathan Trott compling an unbeaten 219 in the same match. There may be some concern that this “no-toss” rule isn’t providing spinning tracks, but roads. It’s a small sample size thus far (and I remember plenty of early season games at The Oval with large scores) but the portents are that the rampant green tops aren’t in evidence. It’s early. If anyone is remotely interested I’m thinking about going to Day 1 of the Surrey v Durham game next week, and more firmly, the first day of Surrey v Middlesex on 15 May. Of course, with today’s IPL season-ending injury to KP, I’m even less interested in it than before. There’s been a bit to talk about this week. The punts on Nick Browne (second division runs, eh) and James Vince in Newman’s article were very interesting. There’s the foiling of Giles Clarke’s ambitions, but even so, the brave old ECB will leave him on that unpaid gravy train for a while yet, and then there’s the boring crap about the helmet. Lord, it was a good story by Lizzie, but hell on earth, what a fuss. Do you remember that terrible furore when one of our number said that the only way that the English medical team would learn is if one of our fast bowler’s career ended due to their mis-diagnosis or willingness to play with injections? Well, he put it a little less subtle manner and the you know what hit the fan. Now Strauss wants answers over Wood? I do hope that penny is finally dropping. Good luck Mark Wood on your recovery. I want to see you back when you are fit and ready, and as pain-free as possible. Anyway, fire away on here. I would ask you to respect the conditions regarding the blog. I’ve let a lot of the semi-political stuff go. I really don’t like it, but I can’t be the dreaded censor. I just really don’t have the time. Amid the early stages of the county cricket season, and away from the bizarre debate about Alastair Cook’s choice of helmet in which to bat, the IPL continues. It is of course hidden away on Sky, as is pretty much all cricket bar the odd tournament on BT Sport, but it is unquestionably the daddy of all T20 domestic tournaments. As such it attracts the very best players, commands the highest fees and is alone in genuinely causing issues around international tours in terms of availability of players – specifically in England, but also in the Caribbean to some extent. It is a riot of colour, noise, explosive action and comprises a definite segment of the cricket watcher’s bucket list of events to attend. So why is it that I just can’t get into it? Now, there needs to be some disclosure here – I am certainly one of the more old fashioned of cricket fans in that for me Test matches are the pinnacle of the game, which is why there have been so many blogs I’ve done expressing concern and fear for the direction that particular format is heading in, but I’ve always been a cricket tragic, able to stand and watch a club game quite happily, let alone higher levels of the sport. Equally, I rather like T20 cricket; for all the organisational issues, the treatment of the Associate nations and so forth, the recent World T20 was thoroughly enjoyable to witness. Test fan or not, the shortest format has plenty to offer a cricket supporter. It may be disposable, it my not live long in the memory except in exceptional circumstances (Carlos Brathwaite, take a bow), indeed in culinary terms T20 generally has all the appeal of a McDonald’s Meal Deal – you look forward to it, devour it as fast as possible and then feel both sick and guilty in the immediate aftermath. But you still go back for another a month or two later. Anyone admitting to more frequency on this needs to have a word with themselves. Thus it certainly isn’t some kind of inherent disdain for the format, indeed the English domestic T20 tournament is watchable, as the crowds going to it can attest. Here is not the place to analyse how it could be improved, or the thorny question of whether city franchise cricket would be a step forward or the onset of the apocalypse, suffice to say it’s part of the season and as such receives attention. So it could just be parochialism perhaps? Except that the Big Bash is not too bad, and given that the timezones involved aren’t always terribly friendly to the UK watcher, it still gets me tuning in more than perhaps I expect, especially at the weekend. OK so, it’s not purely domestic interest. In fact, the Caribbean Premier League is quite good fun to watch as well, especially given that the scheduling of it means that evening channel hopping can be rewarded with that joyous “oh there’s cricket on” feeling when you come across it. The ultimate expression of that incidentally is during the New Zealand season, where 9pm means flicking over and these days marvelling at their apparent internal competition to build the most beautiful grounds possible. But the IPL is by far the biggest and most important of any of these competitions, the one where even if you are being entirely parochial, you can watch the English players and will them to succeed (unless it’s Kevin Pietersen of course, in which case certain sections of the British media and public will be sticking pins into a doll throughout – peculiar, but not surprising). English players who do go learn a lot, and bring it back into the domestic game – a player in the recent past may have advocated just that – and if you succeed in IPL then you’re on the fast track to both the international level, and indeed all the other T20 tournaments around the world. It matters, especially to players who need to earn a living. Of course, franchise cricket struggles to build any kind of affiliation for the teams, despite the weaknesses of county cricket, Premier League football or similar structures, they do at least have the advantage that longevity has lent them; if you’re from a specific county for example, chances are that you have an interest in their progress. The same does apply to geographically based franchises too, but with a much higher prevalence of shifting around, the emotional bond is going to be more fragile, as might be deemed the case in US sports. It is still there of course, but for overseas viewers it’s much harder to build in the first place, which makes the support of Premier League football teams from the other side of the world a slightly curious phenomenon. In that instance, at least they aren’t likely to up sticks to a different city, MK Dons notwithstanding. Yet active support of a specific side isn’t remotely a requirement to either enjoy a competition or pay close attention to it. The IPL has everything you could want in a tournament even if you don’t care in the slightest who wins – in that sense it’s the purest of sports enjoyment, in that it’s for its own sake. Certainly it’s highly popular and not just in India. Friends of mine make a point of watching it, and talk about it on a fairly frequent basis – usually in terms of “Did you see…..” to which the answer is invariably “No”. Now, this is not to say that the IPL is specifically ignored for those reasons, I couldn’t give a stuff who wins the Big Bash either, and actually I’m not even that fussed who wins the domestic T20 Blast (ugh, what is it with these names? Marketing departments all too often belong in Dante’s lowest circle of hell) either. My affiliation to county cricket is, and always has been extremely weak, partly because of mixed county heritage, partly because of a view that the county structure is inherently parasitical both from above and below. No matter, my opinions don’t coincide with all that many people. Perhaps above all it is the sheer naked commercialism on display that is the problem. Sporting events over the last 20 years in particular have become excuses for the already wealthy to become even more wealthy, mostly at the expense of the ordinary fan. It is not sport for the sake of it, it is an excuse to make money. Certainly the Premier League football has become the plaything of billionaires to the point that mere multi-millionaires struggle to compete on a regular basis, but the history and heritage of the game does lend a degree of respectability to the competition, even if that isn’t really what they deserve, and which they may well lose in years to come. But the IPL is different in that it was conceived specifically and solely as a means of generating profit and income. The sport is entirely secondary to that, in fact it’s nothing more than a crutch on which to balance the entire edifice. I love sport, I adore competition. I can rationalise and accept the rampant commercialism when it’s buried within the sporting context, no matter how much it leaves a bitter taste in the mouth. But when the rampant commercialism is the sole purpose for it, that’s harder to do. The Big Bash is actually no different, except in scale and degree. That scale and degree is probably the only thing that elevates it to paying any kind of attention. And therein lies the specific problem. The IPL is the epitome of the theft of sport by vested interests in order to enrich themselves. The amateurish ineptitude of the ECB has inadvertently lent a slight degree of charm to the English T20 game, one that organisation would walk over hot coals to get rid of. The Big Bash is simply a lesser IPL and has a degree of attraction more or less solely on that basis – although at least Cricket Australia plough back some of the revenues into the game for the sake of the game. The IPL takes it to the point where the sport is not just secondary, not just incidental, but where it actually doesn’t matter at all. It is no more than a fig leaf, nothing else but an abrogation of the central tenet that the sport is in itself the point. And when the sport has no purpose as sport, then there’s no love in it. All sports need that love of the game. I have tried, and I have failed. I’ve watched bits, I’ve seen players do what they can do so brilliantly, and if others can take enjoyment from it, then may it profit them. But if I cannot care about the game, then I cannot care about the competition. For those that do – enjoy. A Wisden Almanack Fan Writes…..
And no, it has very little to do with this blog being mentioned this year and How Did We Lose In Adelaide last year. Actually, while it is nice being mentioned again, the actual prose accompanying it is a little odd. Most people who I left behind on HDWLIA caught up with me in the next week or so. So “Old” hadn’t disappeared, if you count the three hours between shutting down HDWLIA and starting up Being Outside Cricket as a disappearance. But as Michael O’Leary said “bad publicity is better than no publicity”, I have to say that whatever is written is a recognition of what we do. That’s no bad thing. But to write even a snippet on the blog and not recognise it is more than a one man job (Chris, and lets not also forget Phil and Sean’s contributions too) shows how rigorous it is (I have to say, I’ve not seen the full article, so if there is more in it, then I will correct). It’s also not the first time both your editors have been in there. I filled in the schools piece for my educational establishment for a few years in the 1980s and TLG has his school record in there slightly later than that, the handsome, more able, young devil that he is. I am, by my nature, quite a traditionalist, and yes, that is odd when you consider my attitude to the ECB and to Kevin Pietersen, for instance. Wisden dates back 150 or so years, and I have a collection of sorts, as I try to nab as many of the 1970s ones as I can. I think I’m complete from 1980 onwards. Indeed, I have a spare, bought in error, 1979 one so if you don’t have that, and might like it, let me know! It’s not a passion to get all of them that I can, but when I see one I don’t have, reasonably priced, I’ll get it. I also don’t go for the new release straight away, often waiting until Autumn to secure one at a reduced price. These are tough economic times and all that! My love for it is in the numbers, not so much the written parts. Indeed, in the past, I’d probably have skipped the section on bloggers, or cricket on the internet. I sometimes read the book reviews. But to me it has always been the scorecards. I had a 1987 copy with me for the last few weeks, mainly to assist in “Blackwash” articles, but you look at the scorecards and follow Graeme Hick’s 2000 runs season and immerse yourself in the sheer lunacy of 3 day cricket. Hick made 227 not out against a fully in form Richard Hadlee at Worcester, and just taking myself back to those days is what the Almanack does to me. Yes, it is nerdy, but it triggers memories. Before I bought a single Almanack, when I was part of the Cricket Book Club, I got, as my free gift, The Wisden Anthology 1963-82 by Benny Green. I remember taking it on my cricket tour to the Netherlands in 1984 and finding Nolan Clarke’s name in it on the day I met the great man (it was, if my memory serves, a Barbados v Australia game). Again, though, it was the scorecards. The match reports were great, but it was the numbers accompanying them. Record partnerships, massive innings, freak matches. Wisden and the Anthology were my cricketing education. To a degree, even in the internet age, that is still the case for me, albeit less so. Like all things time moves on and in the tiresome mantra of the modern age, we have to “innovate or die”. The scorecards are on Cricinfo, and I can find what I want when I want, so maybe I’m not the business model they need to continue. Statsguru has long since taken Wisden’s place for looking that sort of information up. But there was always something about reading a scorecard at total random flipping open the book. There are additional awards, which I have to say I find tiresome, but know others don’t, but what I have never minded, and understood fully why it’s there, is the Five Cricketers of the Year. It’s always been clear to me – Wisden is an English publication, and it has been tried in Australia (I have one) and India – that it is primarily focused on the English summer, has always had an eye on English players throughout the year, recognises the great performers from other countries when they tour, as long as they perform here (Jacques Kallis, for instance, had a huge wait to get in) and you are named just the once. It’s that last bit, and the nonsense spouted about it, that gets on my nerves. I like Dennis a lot, but his article today would have had me fisking it a couple of years ago. Dennis prods and pokes, and I think he’s still a friend of this blog, as I am a friend of his! But he is one voice among a number that do this – and it really peeves me. This award has always been different, it has seen some tweaks when some domestic cases were particularly weak, but it has been the same type of award pretty much throughout. I have absolutely zero problem with that. See it as a “I was good enough to get it once” award rather than “I deserve it every year”. Treat it like the stars on Hollywood’s street. If you are good enough to get on there once, that’s all. It’s not Wisden’s fault that other awards might lack gravitas. I think the Cricketer of the Year has the required gravitas, but doesn’t constrain itself to a “Tendulkar, Lara, Kallis, Warne, Murali” and repeat load of old crap year in year out. So people with freak years, like Tim Robinson in 1985 or James Whitaker’s Gary Ballance in 2014 can stand alongside Don Bradman and Jeetan Patel to pick out two diverse names. Keep it as it is, Wisden. Ben Stokes role in the Lord’s test against New Zealand transcended the match. His century was brilliant, his first innings 90-odd even better in my opinion, and his slaying of the New Zealand titan on Day 5 was arguably one of the moments of the season. He had a reasonable Ashes, not spectacular, but again provided moments. As much as a stat nerd as i can be, you have to recognise what the game can be about. No problem with Stokes. At all. One of the other complaints raised is the presence of convicted match-fixers in the list of Cricketers of the Year, but Mohammad Amir was not put in when he qualified. Again, erasing history is a difficult thing to do. The 1991 edition, should you come across it in the shops, isn’t going to have Azharuddin’s pages ripped out, is it? I am not sure what a futile gesture like that is going to achieve, to be honest. And where do you draw the line. Shane Warne is a convicted drug cheat. Should he be in? Now, of course, some of you might think this blogger’s friendly relations with the Editor of Wisden plays some part in my little defence. It probably does, although we do not converse on Twitter anywhere near as much as used to, and I still shake my fists at the screen when I read something of his I do not agree with. But I think Lawrence has done a pretty damn good job of editing Wisden (except handing anything KP related to Patrick Collins! ), I suspect it’s a hell of a task for him and his team, and that he has, in my opinion, raised the profile of the Almanack in his time in charge does him a lot of credit. This is one pillar of the establishment that needs to remain pretty much true to its soul. Whether that stands the tests of time is up to the consumers. But in the digital age, I still love that little big book. That’s why even getting a mention in it makes me proud of what we have all achieved. You don’t quite realise how proud I am. Long may Wisden Almanack continue. I come to praise. I leave the sniffiness to these kinds of reviews – I think the first paragraph is so amusing…..
Remember…the new open thread is below. The first open thread seemed to work well, so let’s go for it in week 2 of the County Championship and the second week of fixtures in the IPL. The last thread went in many directions, and not many referring to the cricket. That’s fine. We are well catered for in terms of county blogs and such like. But still, if there’s something on your mind, then let’s have it here. I’ve been out of commission all day today, having had to go to Germany for work, but was amazed at some of the stuff I was reading. Did someone really say Kumar Sangakkara struggles with English? Really? You do have to wonder. 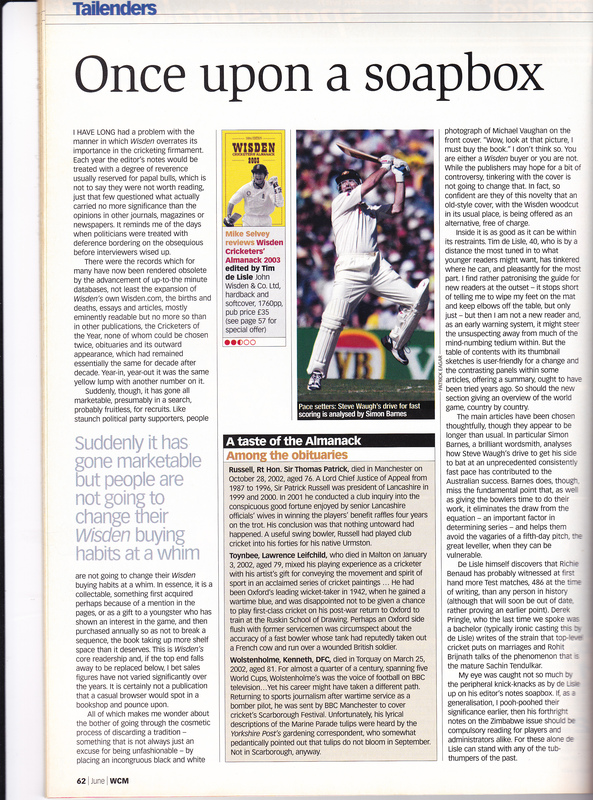 I’ve also got a piece on the Wisden Almanack to put up (it’s missed the boat a little, but still, let’s do it) but I’ll do that later tomorrow after this thread takes hold. The Wisden dinner is this evening (no, I’m not going – so we’ll have to wait to hear how The Odious Giles Clarke will disgrace himself this year) in advance of the Almanack’s publication tomorrow. Snippets have been released to the media already, such as the announcement of the five Cricketers of the Year, namely Ben Stokes, Jonny Bairstow, Steve Smith, Brendon McCullum and Kane Williamson. As ever, players can only be listed once as has always been the case, which doesn’t stop the annual complaints about the exclusion of someone who has been awarded it before. The Telegraph appears to have the exclusive extracts in advance of publication (no favouritism to the Mail it seems) including Stuart Broad talking about his Trent Bridge spell to demolish Australia and the piece about Steve Smith being named as one of the five. There is also a note that the Big Three influence on world cricket may be waning, well let’s see about that – there is some good news there certainly but it is far too early to celebrate. I know some on here eagerly go out and buy a copy the instant it is available, so more will be added as we find out about it. A small aside for housekeeping. This blog went through half a million hits this morning. Not too shabby for a bunch of outsiders. When I asked for some input in to further things we could do on the blog during the non-England periods, or when finding something to say proves difficult, one of the ideas that I quite liked was the “Open Thread”. A post where you can post anything on cricket in the comments. I don’t want this to be a lazy “here’s an open thread so do your thing” type affair. I’ll tie it, if it proves successful to a week’s fixtures, and so given the start of the County Championship on Sunday and the IPL on Saturday, this seems an ideal time to give it a go. Also, feel free to comment on anything else unrelated to our posts. It’s all in your hands whether this works or not! On other matters, I will have a lot of spare time at the end of May/beginning of June so will look to update The Glossary. Any suggestion of definitions will be welcome. Where’s Phil A when I need him? Note – there is another post published last night below this on county cricket so read that if interested too. Today is Downton Assassination Day. On 8 April 2015, Tom Harrison announced a restructuring of the ECB top brass and our man Downton was gone. Assassination sounds too harsh. I kind of appreciated him. Without Rupe, I wouldn’t have had much to write. Without Rupe, we wouldn’t have a title for this blog. We owe him much. It is worth sparing a thought for the man, a great appointment, full of aplomb, and a titan in an era when we needed one. Lauded as “great behind the scenes” at the start of his wondrous reign, we will all remember the wondrous interview with Aggers (winding up with me getting a threatening Tweet from an Aggers fanboy), the “something must be done” stuff with Cook and Warne and then the will he be skipper stuff in Sri Lanka. Then came our favourite interview when he tried to get ahead of the World Cup elimination. On this sad day let us be reminded of an article that bade him farewell. From the man who anointed him with aplomb on the day of his first public announcements.. Despite his 30 Test caps, his part in an Ashes-winning campaign and durable playing career, as well as being a thoroughly affable chap, Paul Downton will go down in cricket history for one thing. He is The Man Who Sacked Kevin Pietersen. “A thoroughly affable chap”. There you have it peeps. That’s what it takes. That will be his legacy as it was his curse during his short time as managing director of England cricket. He took what was a brave, perhaps necessary, decision within days of officially starting in the job last year and it came to stalk him wherever he went and whatever he did. Because he never explained why. Lawyers or something. Disconnected or something. 10000 runs as an ambition or something. Fielding at fine leg or something. Perhaps it came to affect his own outlook. Downton could barely emerge from his office without being asked about Pietersen and was never quite able to offer definitive reasons. On the occasion he did, he was lambasted for breaching confidentiality agreements. It really is / was reprehensible for the paying public to demand an answer. Especially when the media weren’t exactly falling over themselves to find out. As the months wore on, it became increasingly clear that Downton, while he had a deep love for the game, was out of touch with its modern version. He recognised that England were playing an outdated brand of one-day cricket but never quite detailed how he might change it. It took a genius, after that World Cup, and that build up to recognise change was needed. Also he had a deep love for the game is a baseline requirement, not some special trait. In his last public utterances, he was confident and measured until the name of Pietersen was mentioned, when he virtually seized up. It is not without irony that he should have said: “I’m not saying everybody’s job is safe and I’m not saying that everybody is going to be sacked. It feels as though, from your perspective [the media’s], there needs to be a scapegoat. There needs to be a target. Said the man who scapegoated someone after an Ashes whitewash. I wonder why he had to go. Confident and measured said the scribe. I’d say this indicates a frazzled mind and someone without a clue. The article went on. The link is at the end. Downton provided this blog with a ton of ammunition because he was out of his depth from Day One. We said it here and on HDWLIA. The press didn’t. Remember that. Some of the press were incredibly sceptical of the appointment of Moores, so at that point they might have been thinking there were doubts with the man making the decision, but they didn’t show it. Far more important to them was the grandiose decision, the “taking the bull by the horns” act of scapegoating Pietersen and yes, it did define him. In the process the ECB showed contempt for the fans, and the press showed contempt for their audience. They hoped they’d get away with it, and they probably have. But Downton is the main symbol of their approach. Sure, it’s a little unfair to pile it all on Downton, but he was their lightning rod, and he got the strikes. He was the first one truly jettisoned, and yet he did the ECB proud in disposing with you-know-who. Now we await the ECB accounts to see how much he was paid off. For failure. They are due soon.